Why are the two cops who killed unarmed Noel Aguilar not fired and charged with murder? 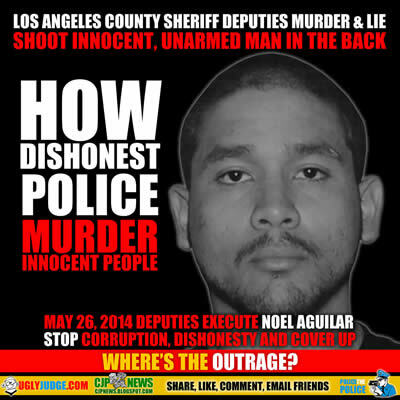 On May 26, 2014, two Los Angeles County deputies killed 23-year old Noel Aguilar in cold blood. They claimed he shot an officer, but this is a lie. Police then repeatedly shot Aguilar in the back, handcuffed him and sat on his back until he died. He told them he was dying. Onlookers repeatedly yelled that he was dying, but it appears the police fully wanted him to die. The cover-up of their apparent murder of Aguilar began immediately and was widely supported by the local press in Los Angeles — which often provides first cover for police. Nineteen months after Aguilar was killed, an anonymous bystander who filmed the entire ordeal gave the video over to attorneys for the Aguilar family — who in turn submitted it to the local press, local law enforcement and the Department of Justice. I had never heard of this case until now. Looking at the old press coverage, I understand why. The day after he was killed, the Orange County Register made the most important part of their story the fact that Aguilar had been a gang member. A week later, in their feature on the story, the Los Angeles Times reduced Aguilar’s humanity down to being a “transient” — only advancing the notion that he was some form of subhuman who may have deserved death. Is that really the most descriptive word they could find to illustrate who this man was? In that same story, the original police narrative of a shootout between Aguilar and two deputies was shared even though no such thing ever happened. Aguilar appears to have never fired a single shot at police. Now we know full well that it was all garbage designed to protect the officers and demean the man they killed. Just as police cannot actually explain what Freddie Gray ever did in Baltimore to be stopped by police in the first place, officers openly admitted that they originally stopped Aguilar because he was riding his bike with a pair of headphones on. Really? Do they stop every person who is wearing headphones? Because I lived in Los Angeles for years and saw people riding with them on every single day of the week. While police claimed that Aguilar ran from them, it’s hard to believe anything they say about this case at this point. The new video that has been shared begins with police on top of Aguilar, who is on his stomach. Bystanders are filming and watching from the gated stairwell of an apartment just feet away from the entire ordeal. Nobody has been shot at this point. Within seconds, Deputy Jose Ruiz shoots Deputy Albert Murad in the stomach. Writhing in pain, Deputy Murad immediately begins blaming Aguilar for shooting him. Instead of speaking up and admitting that he fired an errant shot that hit his partner, Deputy Jose Ruiz goes silent on the matter. Knowing that he is in grave danger, Aguilar tells the officers repeatedly and calmly that he did not shoot them and does not have a gun on his person. The Truth About LA Deputy Shooting of Noel Aguilar?